It's time to renew your membership. All memberships run through the calendar year. Join now and receive the last newsletter of 2018 as a bonus. It featured KIDDING as the main topic and reported on activities during our statewide conference. 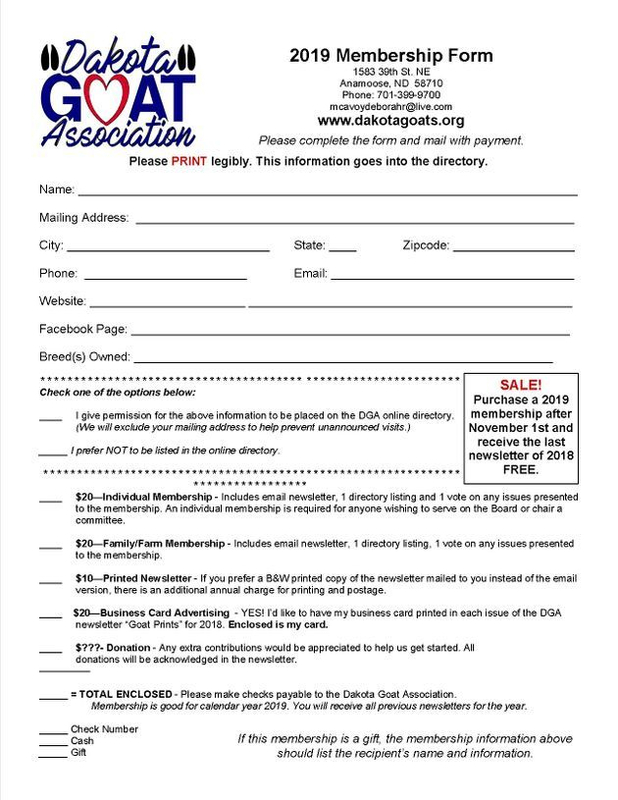 The DGA is an association for anyone who is interested in any type of goat including dairy, meat, fiber, fainting or pets. Through the DGA, you'll be able to meet others with the same interests and concerns. We're holding or assisting with a variety of events ranging from basic education to performance programs. Please note that we're based in North Dakota and all activities will be taking place here. Contact any steering committee member if you have specific questions or suggestions. Are you willing to promote the DGA? Click here to download a poster ready for hanging.